1 For many years, the political scene in Canada was dominated by the English Canadians. That changed after Lester Pearson became prime minister. As leader of the Liberal Party, he had a good eye for potential leaders. If those leaders came from Quebec, it was so much the better. One of those men was Pierre Trudeau. 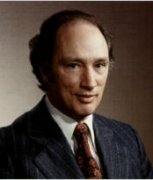 2 Trudeau was born in Montreal on October 1, 1919. His father was wealthy, and young Pierre attended an exclusive Jesuit school. Once he was out of school, he traveled widely and purposely threw off much of his Jesuit religious training. He became a champion for unions and promoted religious freedom. 3 After earning a law degree from the Universite de Montreal in 1943, he went on to get his advanced degree in political economy at Harvard. 4 While working on his degree in Montreal, Trudeau was conscripted into the army. He joined the Officers Training Corps but did not serve overseas. He was kicked out of the Corps for having a lack of discipline. 5 After the war, Trudeau studied in the United States, Paris, and London. By the late 1940's, he was back in Montreal and viewed as one of the intelligentsia. He became a leading opposition figure to the rule of Quebec Premier Maurice Duplessis. As the founder and editor of Cite Libre (a dissident journal), he began to lay some of the groundwork for what would become the Quiet Revolution.